Nice to (not) be having weather. Although it’s been about 60 or so every morning, eventually the gloom burns off sometimes and we get a little sun and semi-warmth. Today we took advantage of the weather and got a few tasks crossed off the list. Nancy applied acrylic sealant to the toe rail to try to stem the small leaks. It’s supposed to capilarize into the seep paths and then hardenify. Yeah, sure. This is what the whales see right before we discuss their ESA status. 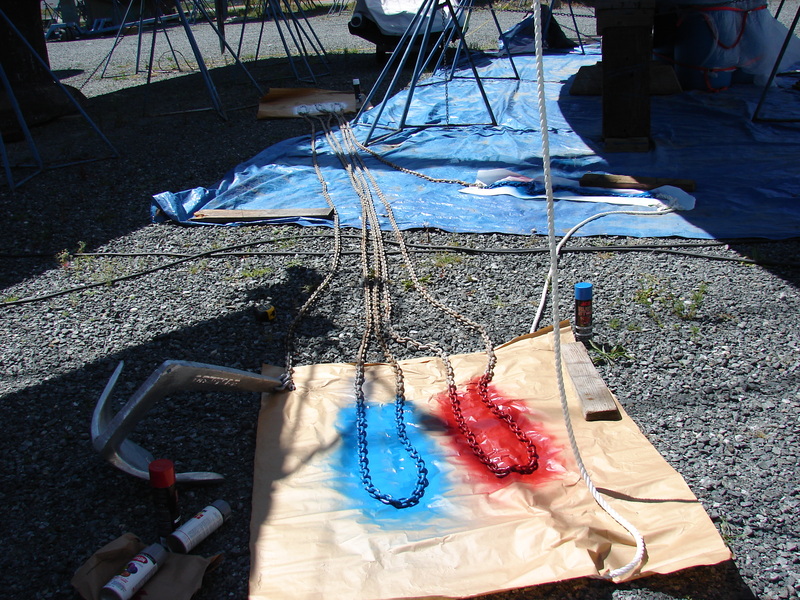 Also, we hauled the anchor chain to apply our ultra-sophisticated chromatic calibration system. 25′, 75′, and 125′ are white. 50′ and 150′ are blue. 100′ is red. There will be a test. 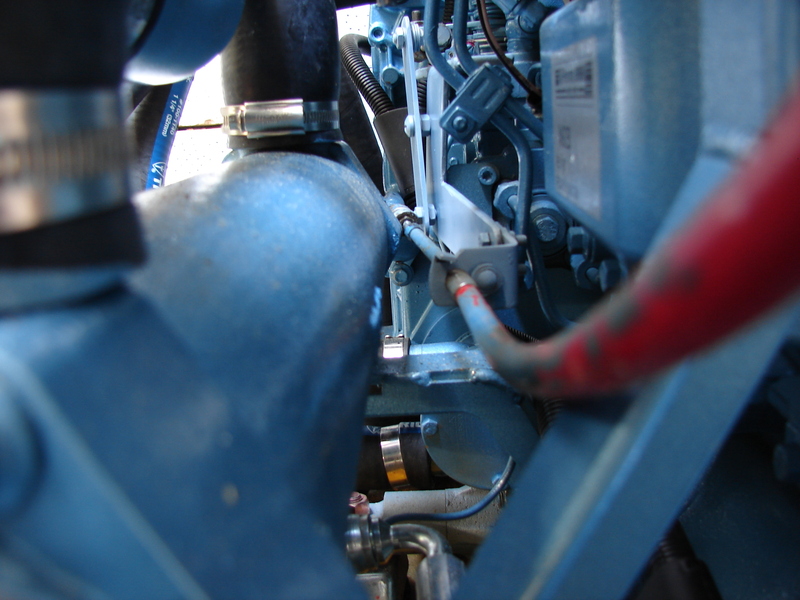 After the 150(ish) feet of 3/8″ chain is 300′ of 5/8″ nylon rope. We’ll put markers in the rope later. They don’t need to dry. 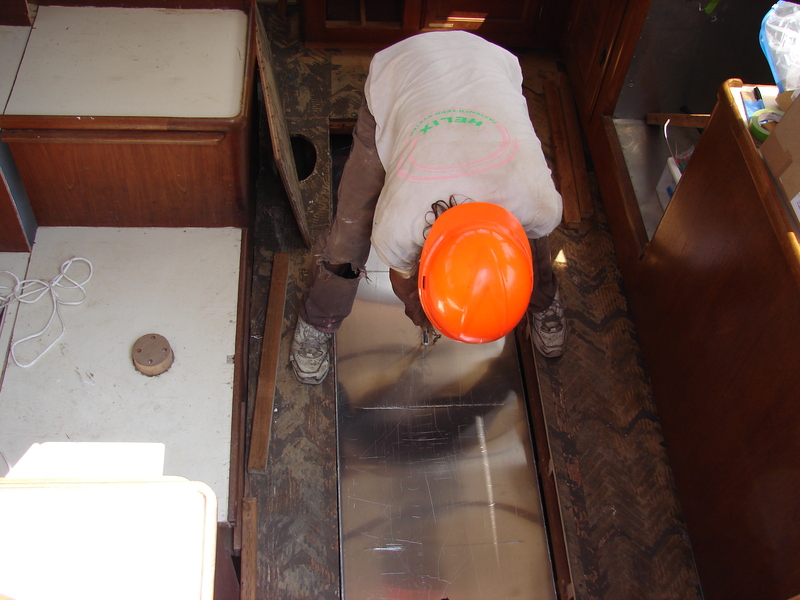 getting the swim step finished and installed, as well as cleaning off the transom and getting the new logo ready. 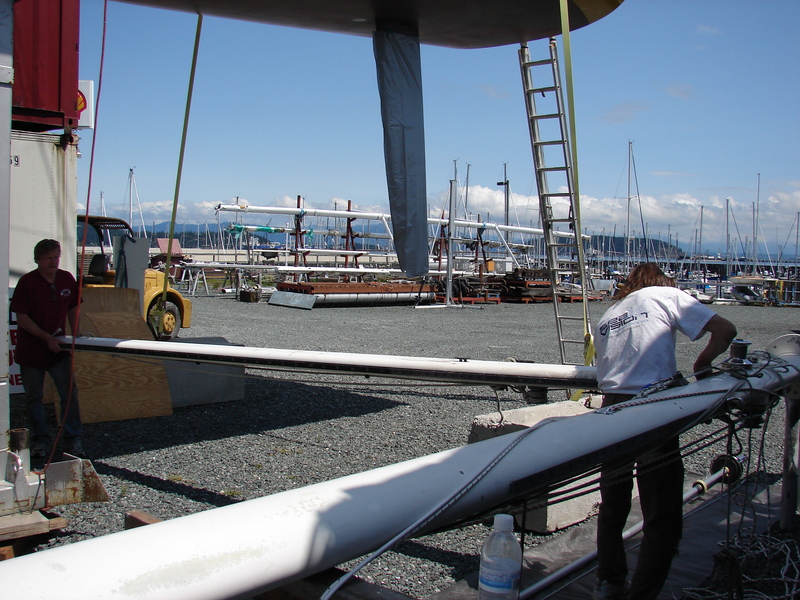 Getting the Mast back together. Bob and Barb wanted to work on the boat. We wanted help with the mast. The negotiations were intense. A deal was struck. 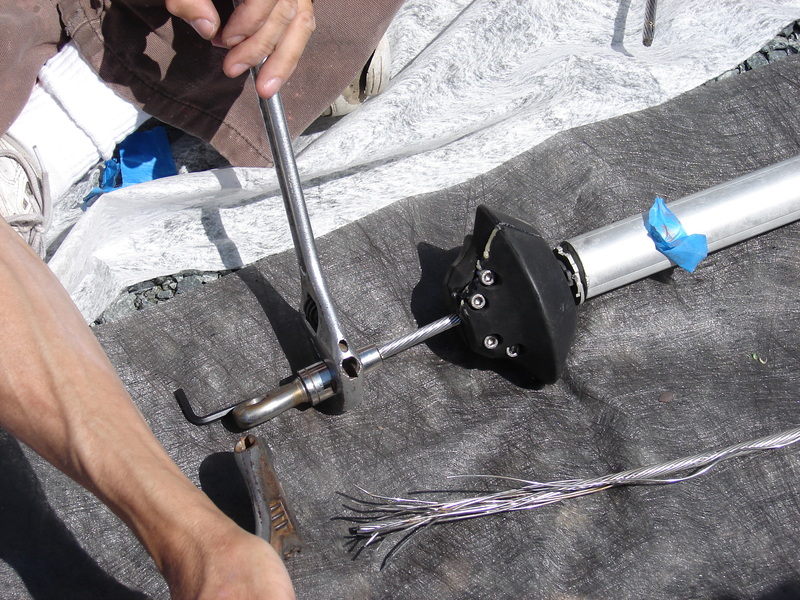 First we had to disassemble the roller furling. It was originally assembled (years ago) without locktite. 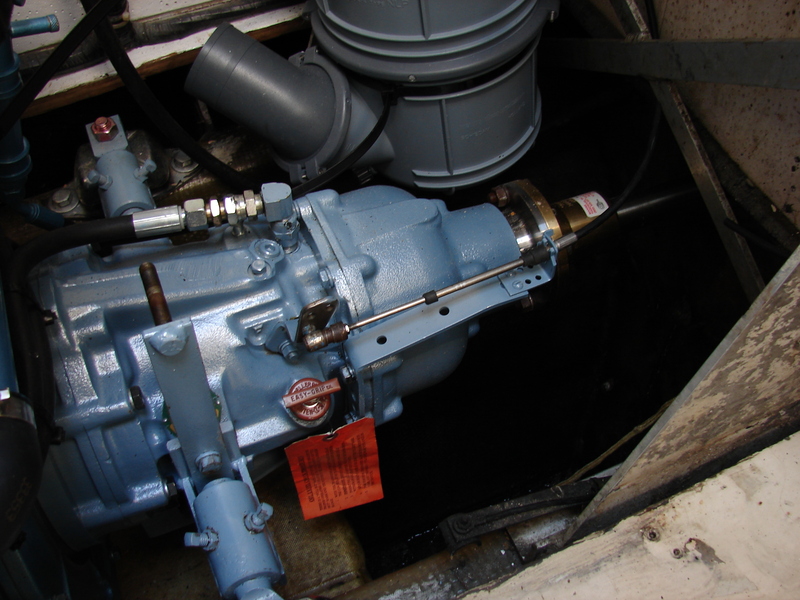 Roller furling systems that fall apart are approximately as useful as liquid dinnerware and as safe as gasoline toothpaste. 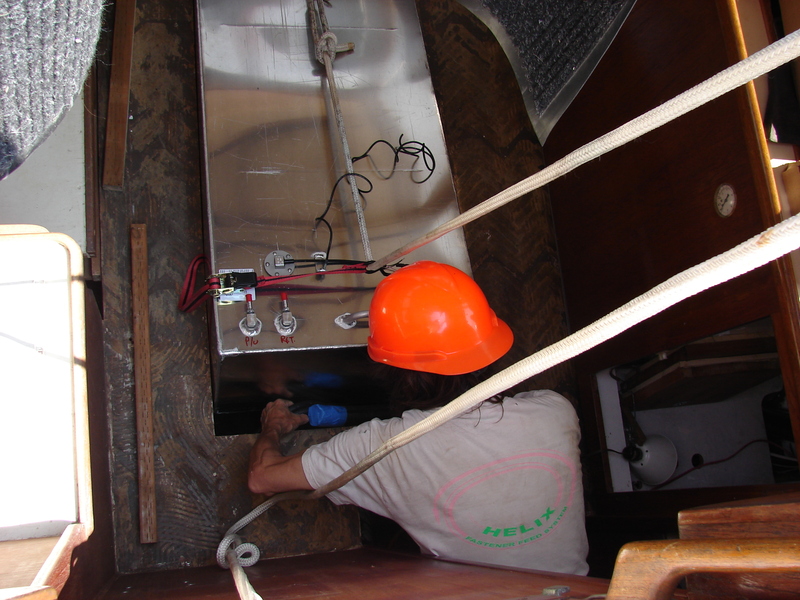 Then we had to clean out the fastener holes with a tap and clean up the full dog ss setscrews with our thumbnails. 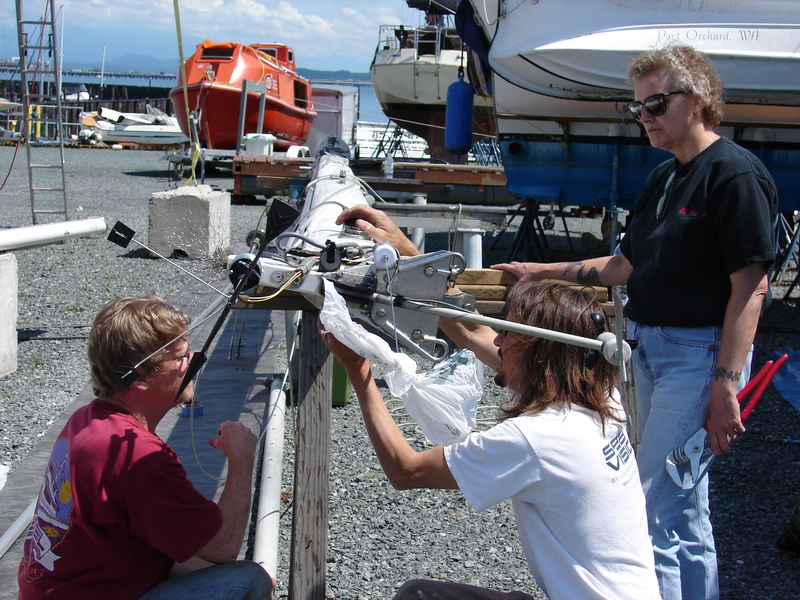 Then we reassembled the roller furler over the new headstay, using red locktite. Interestingly, the red locktite came in a blue tube. The blue locktite came in, you guessed it, a red tube. 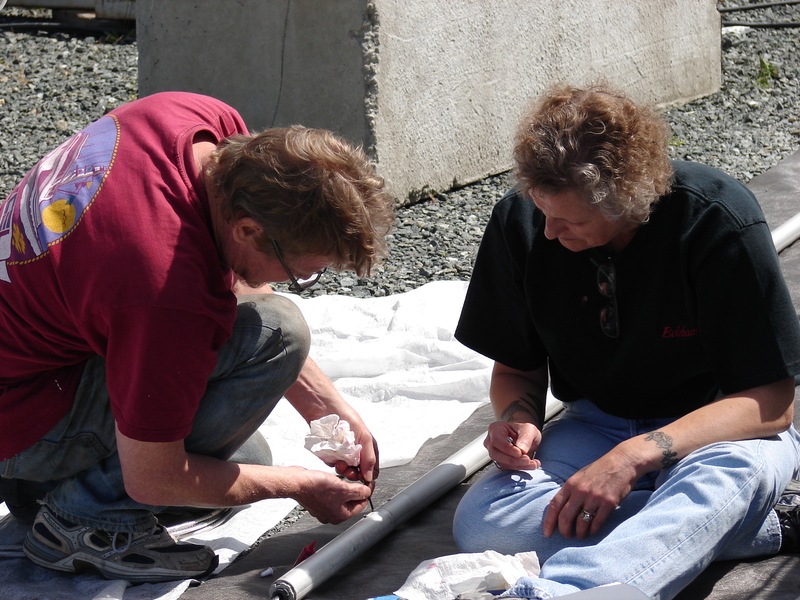 Once the roller furling stack was rebuilt, we had to cut the new forestay the same length as the old forestay. 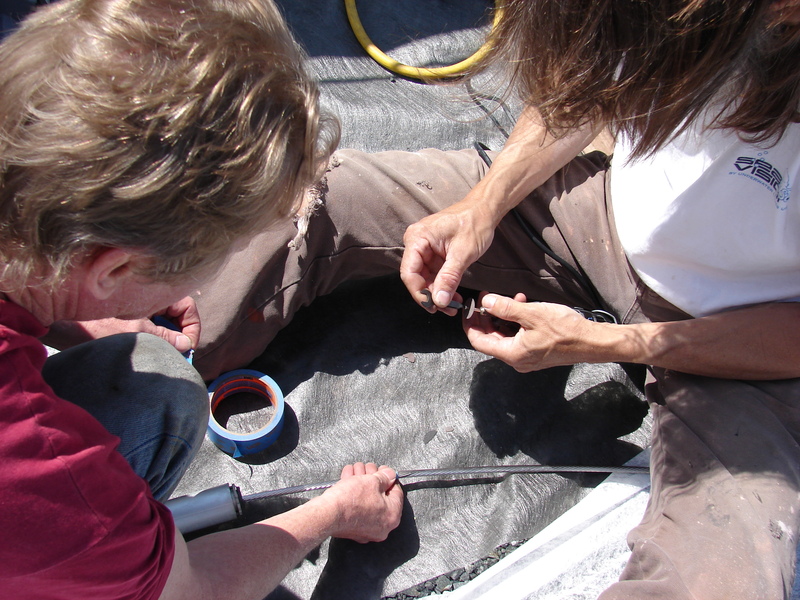 I’d never cut a forestay before, so we broke out the Dremel tool and cutoff wheel. We went through a lot of cutoff wheels. The wires would catch as they came free and shatter the wheels. So Bob grabbed the blue tape. That controlled the loose wire ends, but we still had to cut the last wire with a bolt cutter because the spindle eventually broke. 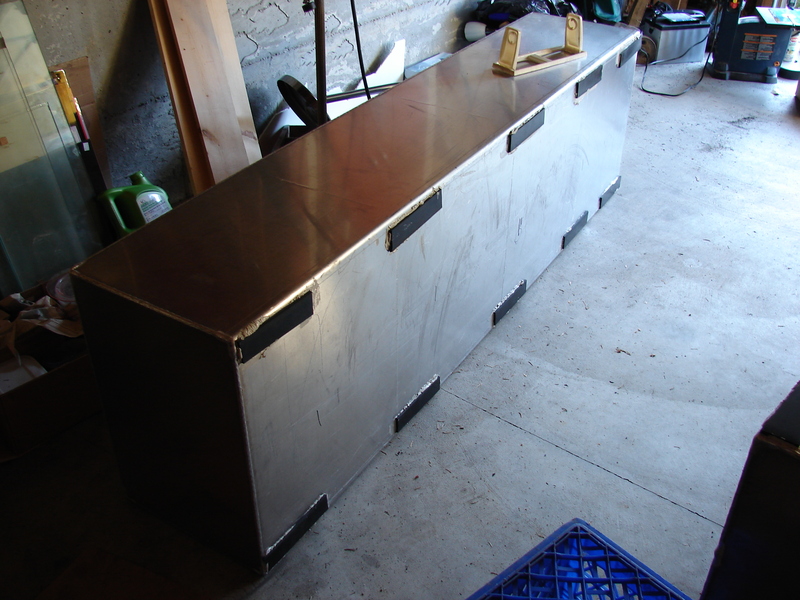 Then we had to install the Norseman end fitting. 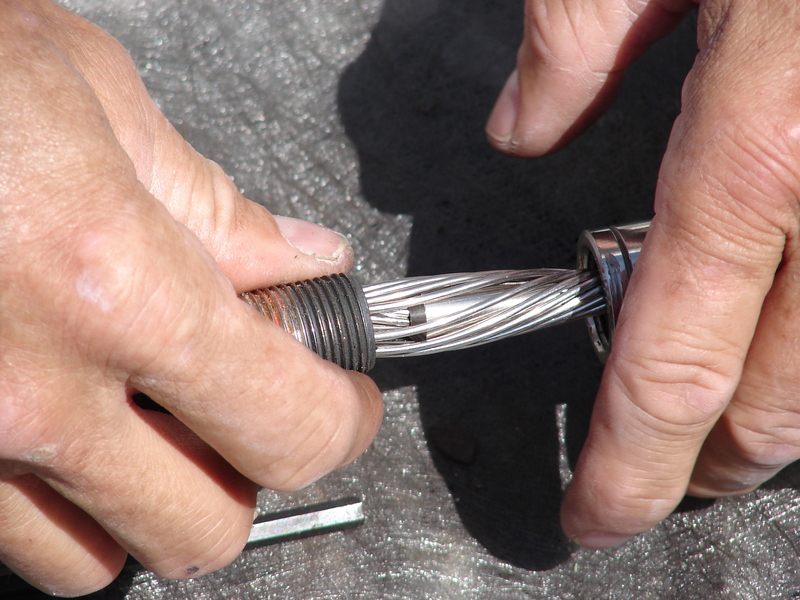 The cable wires are splayed and reassembled over a ferrule, then tightened into a big crimp doodad. We put it together, took it apart to inspect the process, then reassembled the whole thing with more red Locktite. The frayed mess under the new forestay is the old forestay. The new one is completely identical except it’s not frayed or a mess and it’s new. 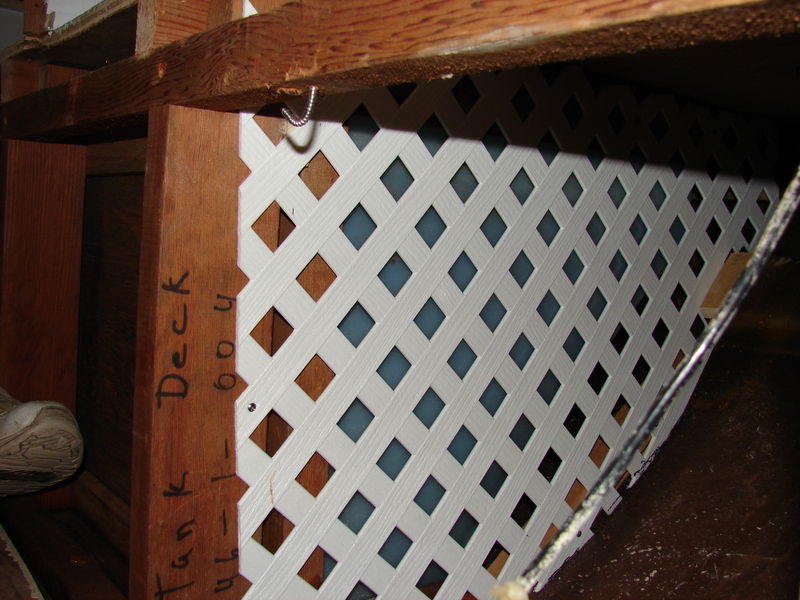 The original spruce spreaders were rotten and cracked and, again, spruce. 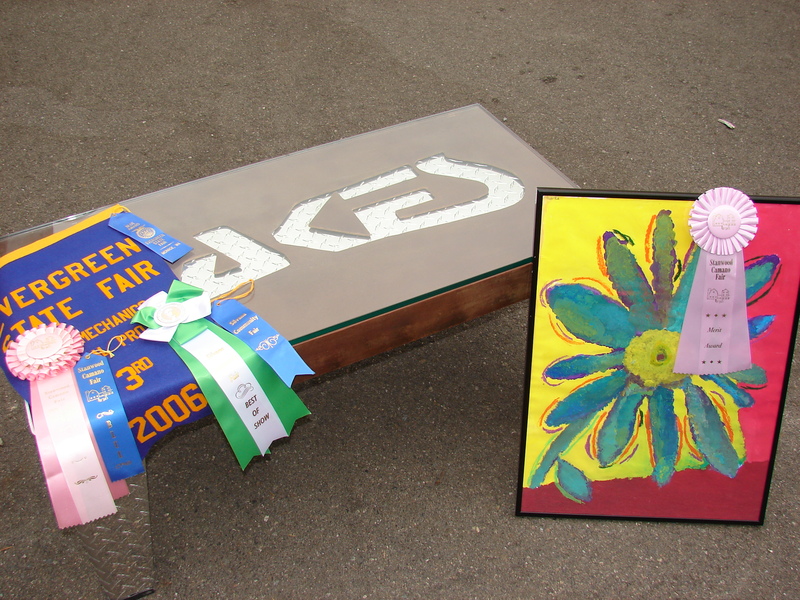 We had aluminum spreaders made and only had to drill the mounting holes to complete the installation. The fabricators were too afraid to drill the mounting holes in their specially equipped facility. I may be too afraid to pay their bill. So, left-to-right, we have Bob on precision fixturing, Phil on sophisticated Harbor Freight drilling system, and Barb on the spray-oil can. We pulled it off, though. Patience and boldness pay off again. Here is the top of the mast. 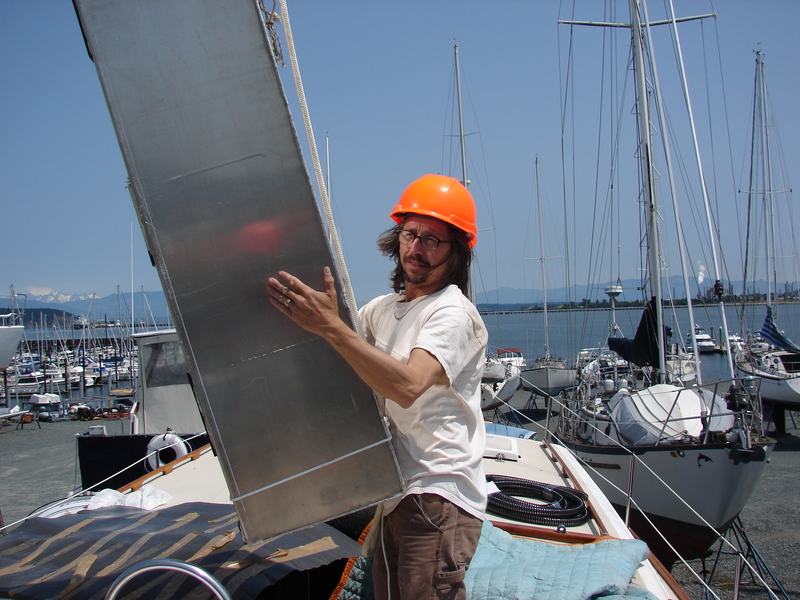 Bob on the left, lightning dissipator flower, LunaSea LED tricolor/anchor/strobe combo with mounted Windex, VHF antenna, me, anemometer/direction transducer, and Barb. 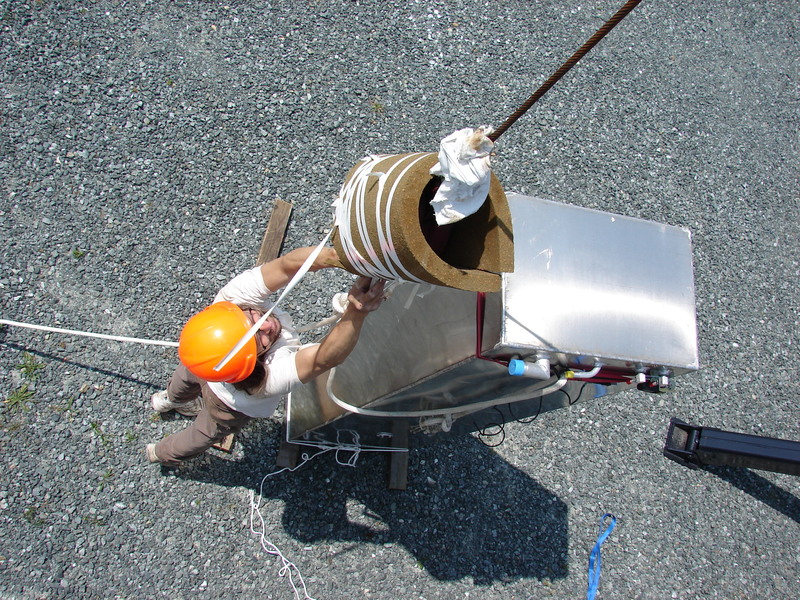 The boom still fits on the mast. That was a relief. Bob and Barb did lots of other work, but we didn’t take any other pictures. The negotiations were not intense. We have friends here in Western Washington. No, really. Some of them have behaved oddly when told them name of our boat, even after we explain that it’s based on a sensitive love poem and an iconic novel of discovery about a man and his weasel. 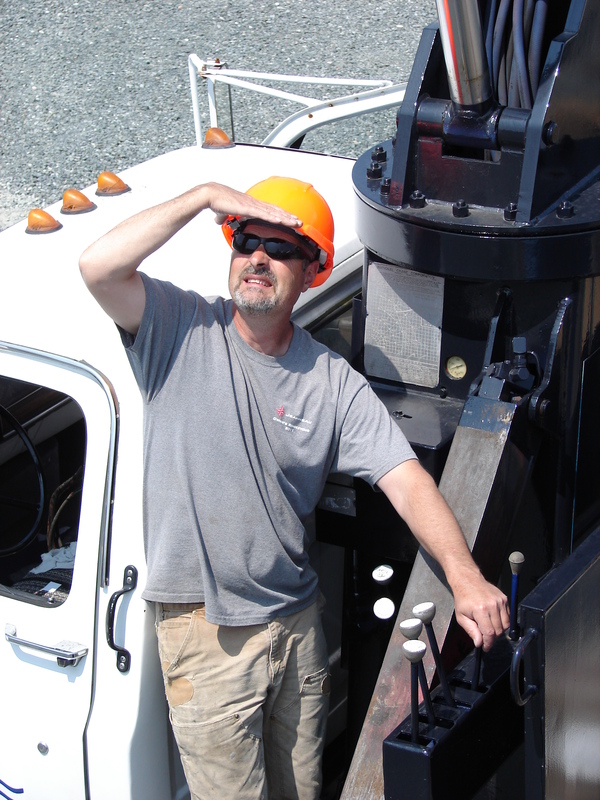 So, just to be clear, except for the cost overruns, schedule delays, and poop management system, our boat has nothing in common with the world’s most advanced waste water treatment plant. Except for the state-of-the-art controls and electronics. And the name thing. the glitter Broadcast on the swift river. Bound me to the whirlwind’s centre. New tanks need new fuel, but all we had was old fuel. 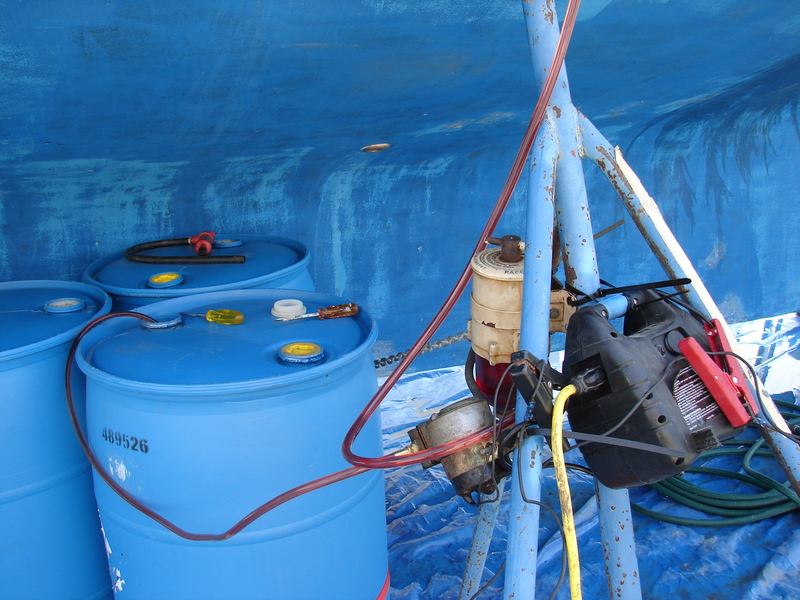 This is the first Northwest Redneck Petrochemical Infusion Transfer System. It’s complexilicious. Anybody want three newly empty poly bleach/diesel tanks? …and we got to wear hats. Just like Curtis wears. Curtis is cool. They even had the liners turned backwards. That’s the way the cool kids wear them. We even wore them inside the boat. Even though the crane was disconnected and we were just sliding the tank into final position. So is getting the tanks installed and all hooked up. 130 Gallons port and 147 starboard, plus 30 in the engine room. 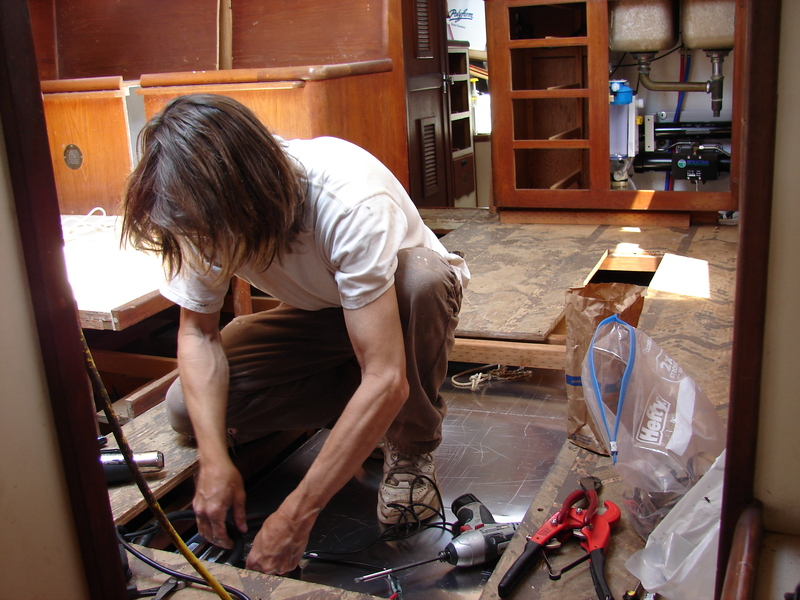 Now we can re-install the floors. We had to give the hats back. A new arrow for the quiver. Some boats have a sail inventory. That seems a little dull. Massively highly-funded racing boats have a quiver of sails to choose from. Quiver sounds better. 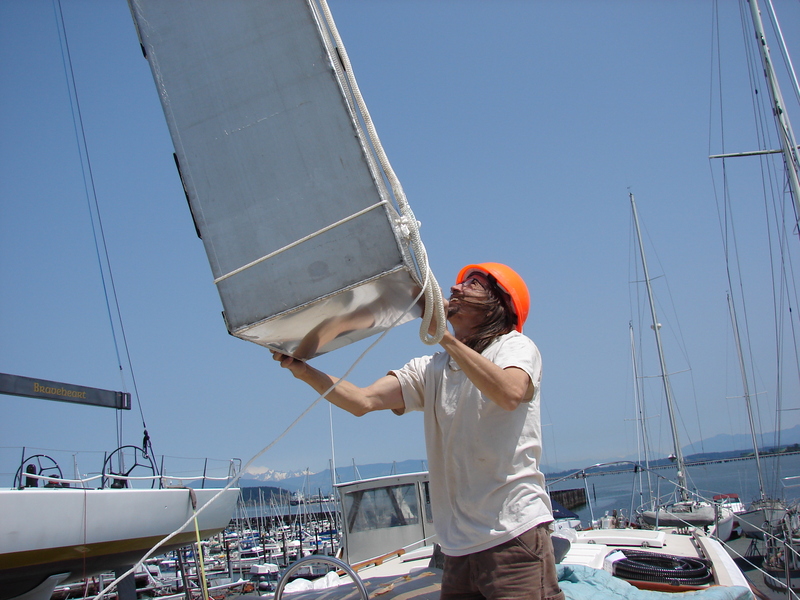 Our boat came with a pretty good mainsail and a jib that’s older than plastics, as well as a ridiculous old main with a zipper in it. So we bought a new sail using the e bay. 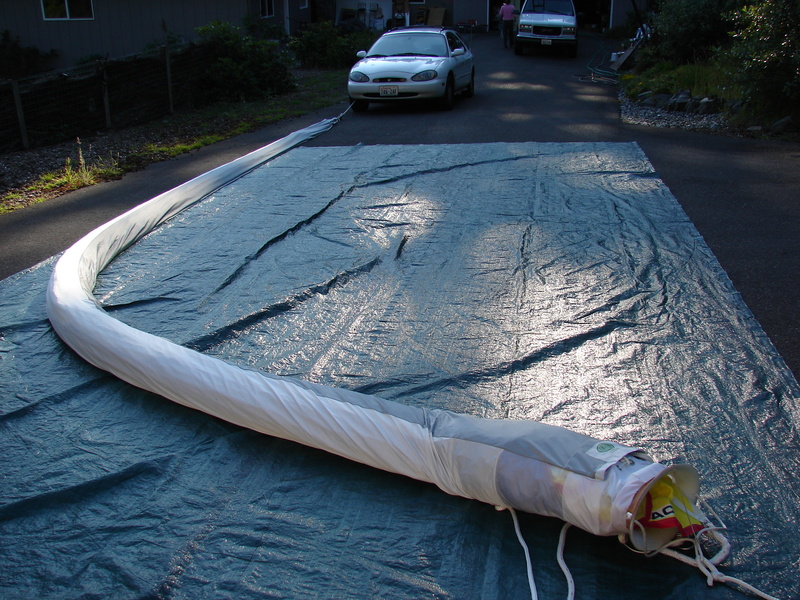 It turned out slightly smaller than we wanted, but it’s brand new and a very good sail so we’ll keep it. It’s an asymetrical spinnaker, or code zero, or screecher, or reacher, or any of several other names that probably mean something specific but nobody that I know uses them specifically. It’s also pretty. 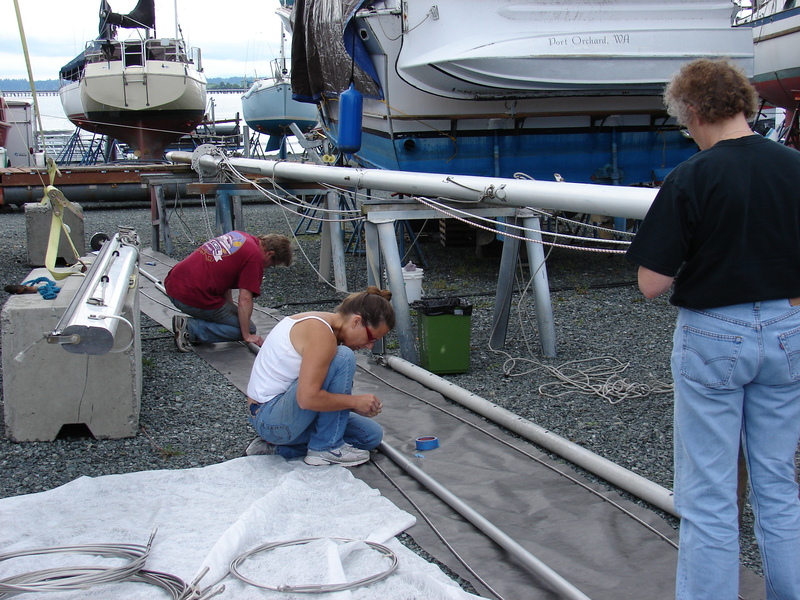 It’s set and flown like a big light jib, which is what it is, but instead of rolling it up on the forestay you “douse” it by covering it with a fabric tube (sock) and lowering it to the deck before stowing it in either a nook or a cranny. 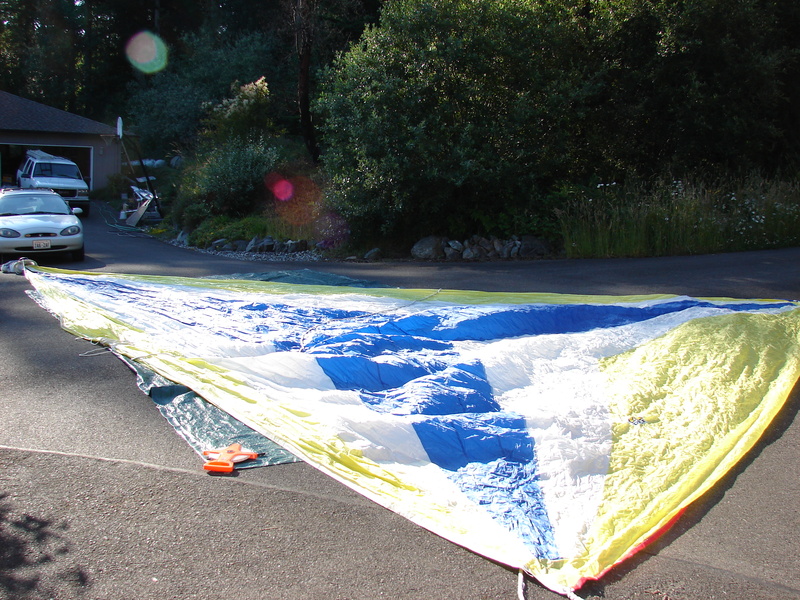 Here’s an incredibly complete video showing how to rig and fly this wombly sail. Here’s another tutorial so you know what to do when you come sailing. 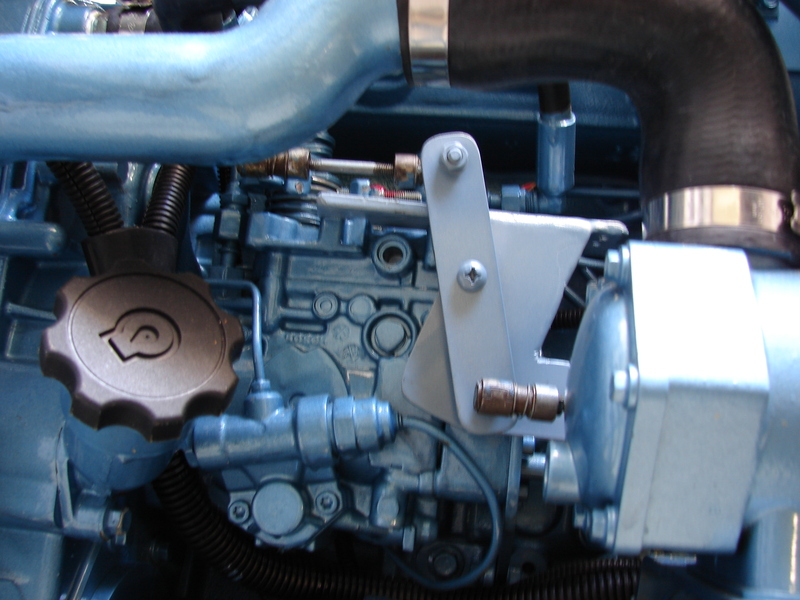 We bought a new Perkins engine because it was supposed to be a drop-in replacement and save us a bunch of trouble. You know what that means. Here is the old transmission. 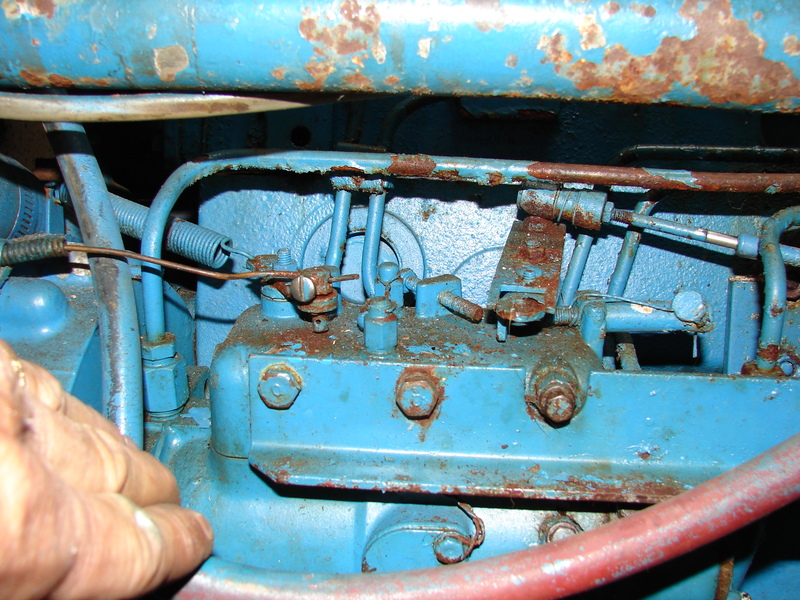 Notice the lever to reverse the actuation on the reverse gear. (If you click on it the picture will get bigger). (If you care). Here is the new transmission. 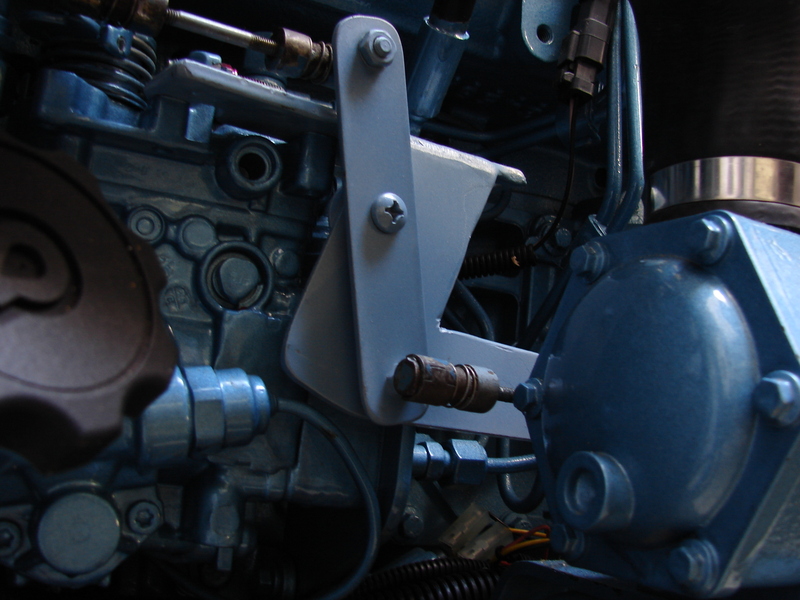 The old linkage was completely un-useable and I had to make a new bracket from some hardware store stuff. Not too hard to do, works well, and is fine. 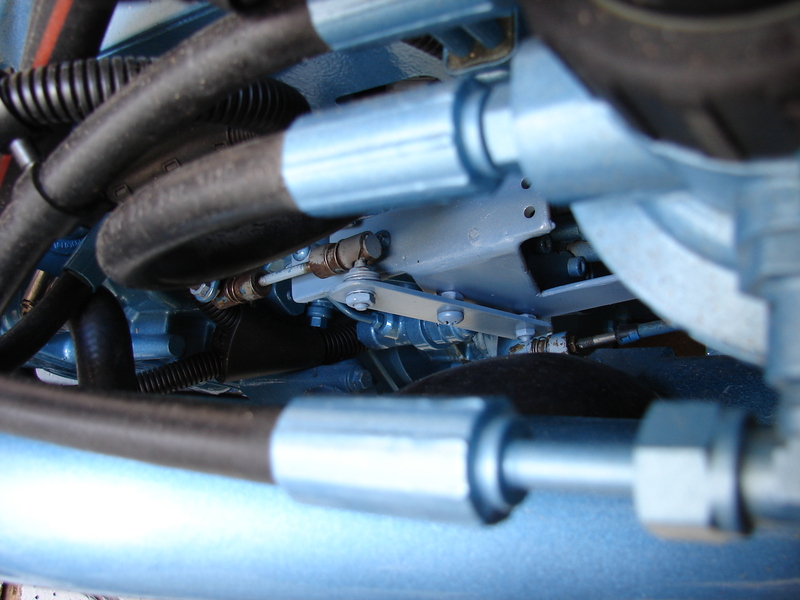 Unfortunately, it’s too late to remove the support for the old linkage. 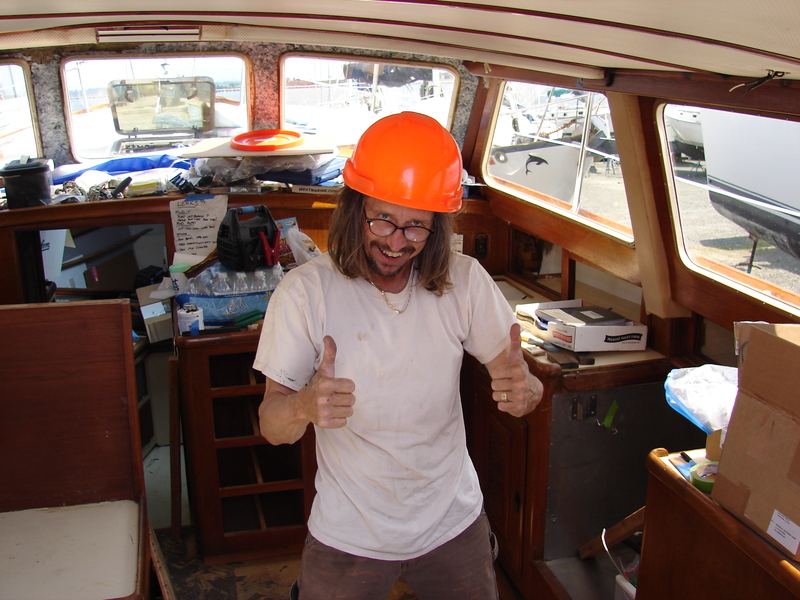 I’ll probably cut it off later, but I don’t want to get steel chips in the bilge. So graphic artists will agree that this bracket’s near-perfection is because it’s made almost completely of negative space. 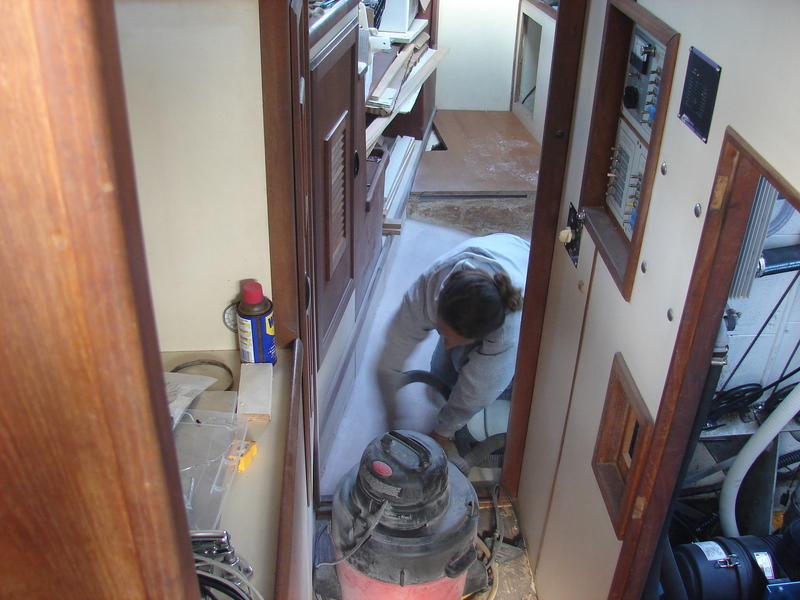 Our old boat has several nooks and crannies perfect for storing …stuff. However, many of the crannies are not quite perfect. 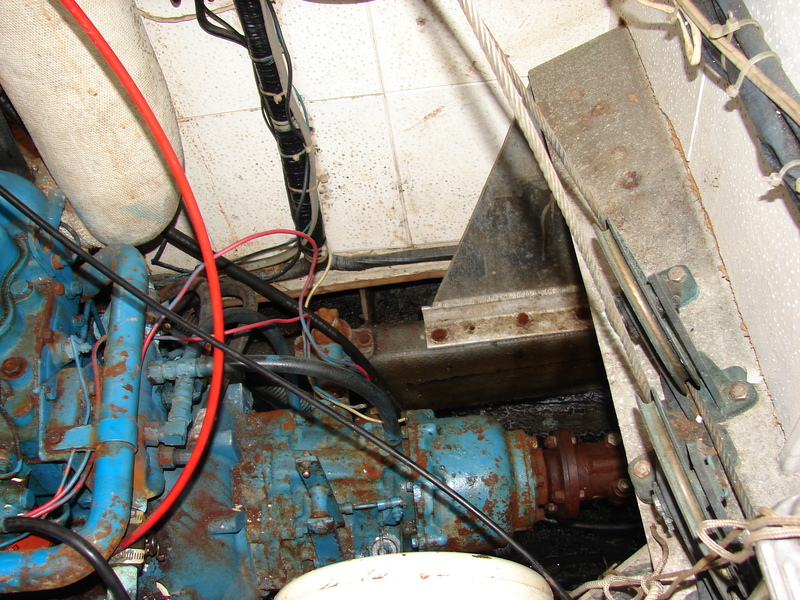 If stuff shifts, stuff can get lost in a hidden nook, or, in this case (under the aft berth), fall into the steering cables and cause the boat to become uncontrollable. So Nancy has been going crazy installing this amazing barrier material from Lowes. 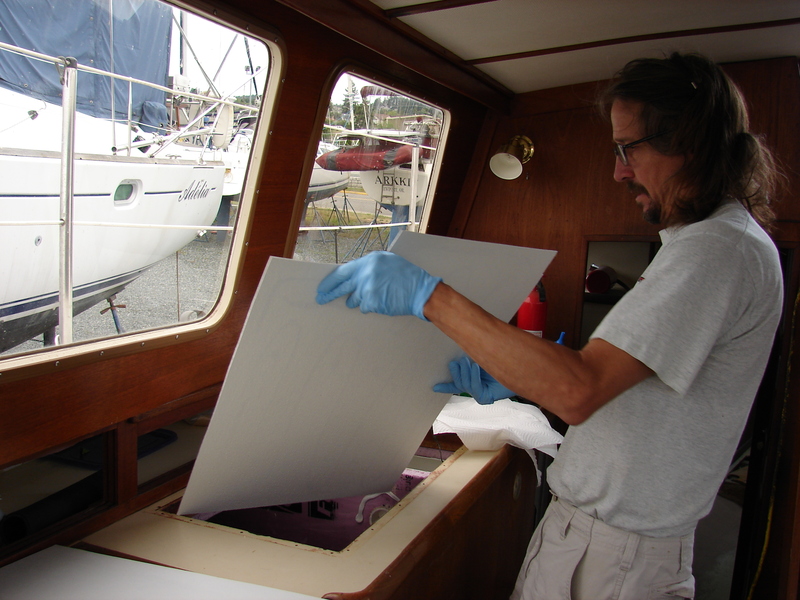 It’s solid vinyl plastic and perfect for yacht rebuilding. 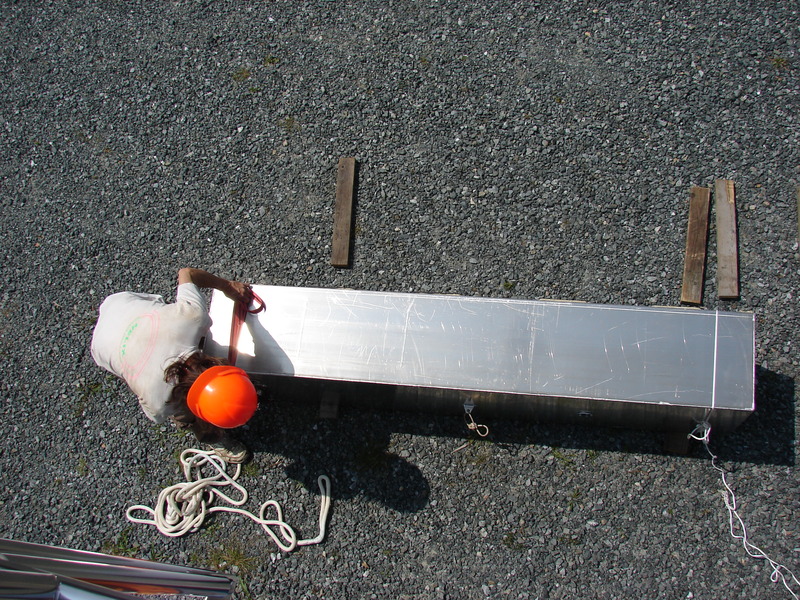 Here is another barrier she installed to protect the port water tank. Home Depot carries a sham ersatz barrier material, but the holes are much too big. You could lose an entire case of beer with one rough wave. They call their version “trellis.” Losers. Not boaty at all. 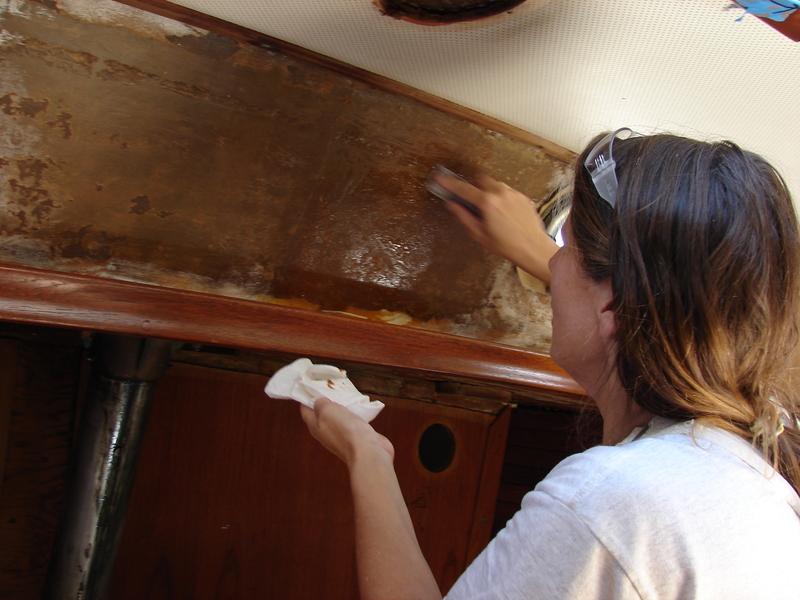 Clean a boat every day for nine weeks? It will be clean, some day.